But even if you can still check your rankings, this belies a notion that SEO is all about moving a site to the #1 spot in the search results. There is a camp that thinks ranking reports like this are important because customers are asking for them; the other camp argues that it is a waste of time because different people get different search results, and that the success of an SEO campaign must be measured in another way, like traffic and conversions. 1. A #1 ranking for a keyword means nothing if the traffic that derives from it does not give you the desired results: leads, sales, downloads, sign-ups, etc. Is the customer clear on his or her specific goals for the SEO campaign? How does he or she know a ranking for “blue widgets” will help achieve those goals? Has the keyword phrase been tested with PPC? Those are more important questions. 2. Rankings can move up and down for a multitude of reasons, and fixation on those fluctuations can make any normal human being crazy. 🙂 For example, Google delivers different results based on the physical location of the searcher, the language setting, the search history, and so on. That makes perfect sense because people living in different places and having different interests would consider relevant things that other people in other places do not. 3. There are more important metrics of success for an SEO campaign. We should not let the client forget the main purpose of SEO, and ranking for “blue widgets” should not be the end goal in and of itself. As consultants, we need to be the ones telling clients which keywords are going to produce the best results, not rankings. Does this means that trying to rank #1 is impossible or a bad idea? I personally don’t think so. Fighting for #1 is like trying to be the best at what you do, and it is well known that #1 rankings bring with them a huge amount of benefits. They receive more than twice as many clicks as the second result (provided it doesn’t have a crappy snippet) and being #1 is a sign of trust to searchers. Users trust that if Google recommends the site as #1, it has to be good. Also, while it is true that for many keywords the location in the search results might shift for different users, for a great many searches this is not the case. Consider navigational or brand searches. People doing brand searches are expecting the same thing and it doesn’t matter where in the world they are, their language or their search habits. 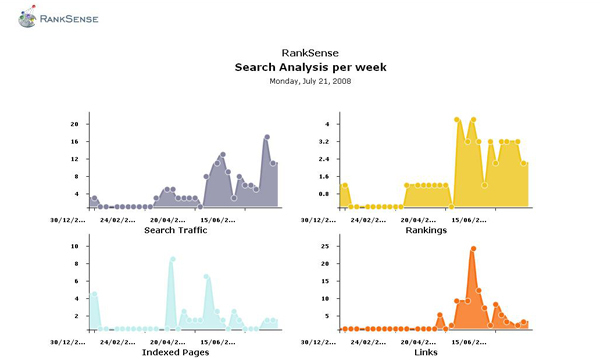 A search for RankSense anywhere in the world should hopefully bring you to my RankSense software! 😉 For many searches, trying to be #1 (or on the first page) for queries that bring in money and don’t necessarily vary much from searcher to searcher is a very good idea, IMO. 1. Search traffic growth and corresponding conversions. I want to know week-to-week and month-to-month how my organic traffic is growing and, more importantly, how many conversions I’m getting from the overall search traffic. 2. How many rankings I have on the first page vs the rest of the SERPs. As I said, I can derive this information from the traffic logs. Getting more visitors from the first page of results than from page two downwards means that I will be getting more traffic, so this indicator supports the first. In addition, I want to make sure my most profitable keywords are on the first page. That needs to be a priority because that will drastically improve my results. 3. How many new incoming links I am getting every week/month etc. If I were the obsessive type, instead of fixating on rankings I’d fixate on how many new links I was getting. Getting links and increasing the visibility of the site will result in deeper index penetration (because the site is considered more important) and the ability to rank for more competitive terms that can potentially result in a lot more traffic. It could also help me adapt my content development strategy to focus on more competitive terms. 4. How many pages I have in the search engine index vs. the total crawlable pages of the site. Last but not least, the easiest way to start getting search traffic from long-tail queries is to create lots of quality content and promote that content. Every page we manage to get into the search engine index is another source of search referrals, so making sure all or most of the pages are getting indexed is a winning strategy. There are several other metrics I use to measure success, but for me the most critical/important ones are these four. Do you use any KPIs to measure the success of your SEO efforts? If you do, please share them in the comments. Fantastic! This is all very useful, but I think the first point is the most impactful... did anyone out there really think that Google's eningeers wouldn't catch on to automated tools designed to game the system? This is just due process running its course. Hamlet I think your point about quality of traffic is more important. Like you are pointing out- Running a ranking report is not SEO. For example, there are companies now that are focused only on conversion optimization using analytics data and optimizer tools. This is a subset of the optimization process. They are turning the work of converting existing traffic into some type of action, into a science. The conferences are not treating conversion optimization as its own category yet but I am sure it is coming. If automated ranking tools are getting blocked then SEOs will have to write their own tools or do a little more manual work based off log file data like you are saying. I really don't think this discovery is going to hurt SEOs at all. I didn't know people were still using Web position gold? I thought that tool died a long time ago anyway. While I agree rankings aren't everything, they certainly are a great measure for keywords that mean alot to your business or that of your client's. The automated tools (including rank sense), are not "gaming" the system, rather I think it comes down to misuse in the volume of terms searched. No one needs to search for over 1K terms per website. Even though the opportunities exist to rank on all of those terms doesn't mean you should track each one. I would equate checking that many rankings to buying all of the coins you can in the mint to hope that one of the coins is valuable enough in years to come to pay for the misuse of your time and money. Very interesting article. How will you keep RankSense from potentially being blocked when it is doing its keyword research? Have you considered Human Emulation such as IBP has built in? Very nice Hamlet. You may have read the debate at seoroundtable? :) I can't say I disagree with anything you just wrote at all. I might add that another thing I look at and also teach clients the same is how many different phrases were they getting quality traffic from when we started to help, and how many are they now getting the quality traffic from? Of course; if it's many more, then my client is successful. ... and so am I. Quality meaning the visitor did something when they found the site. Actually, it really makes no difference what page they found the client on.... but that they did find the client. You can also discover new and different types of phrases that you might not think about by looking at your stats.... then proceed to try harder on those type phrases. There are many more cons from auto rank reports than there are pros. Pros vs. cons goes to the upside when you use all else at your disposal, and the client actually learns something as well. Nice writeup. Hamlet, while you are right that there are always many different ways to achieve the same goals and that the ranking information is not the best evidence of success, it is strange to see you second the gossip about Google blocking WebPosition, WebCEO and oters. How can you imagine this? Oh, yes, I can understand why you are on this! A clever marketer can not miss such an opportunity to speak about RankSense ;) I am ready to hear you all laughing at me, but I use a SEO software (will not name it, I do not mean to defend or promote something). It works and helps me. Nothing is blocked. Excellent post Hamlet. I think the reason ranking reports are so popular is because clients are generally looking for a deliverable - something concrete to measure the success of an SEO campaign. Keyword rankings certainly aren't a concrete measure of success, but they're perhaps easier to define and lay down as a yardstick than some others. For example, you might do a great job with the SEO and drive a lot of high quality traffic, but if the client's website is a dog and they refuse to do anything about it then conversions will still be pitiful. This is hardly the fault of the SEO consultant. Ultimately, ROI is the only meaningul metric but it doesn't necessarily correlate directly to the success of the SEO campaign. Hi Gavin, I have to disagree with you about this. You wrote: "but if the client’s website is a dog and they refuse to do anything about it then conversions will still be pitiful. This is hardly the fault of the SEO consultant." Who's fault is it then? The client hires some firm to help them. They really have no idea what they want, but one thing is for sure... they want MORE SALES. Isn't it the job of that firm to find a way to get them more sales? If not, why not? If you are a SEO firm and review a site that you know is crappy stuff; would you go ahead and take their money for SEO knowing that the site will not sell anything if on page one for many terms? Would you? Do you? I think this is one of the most problem areas the industry has. SEO firms in general do not want to take responsibility for failure if it doesn't directly involve a rank of some kind. If not the firm's fault for taking the money from a not as knowledgeable person, who's fault is it then? Come on now. If you are a firm selling services that supposedly help site owners, it sure is your responsibility for that site's sales, or whatever it is the site wants visitors to do. YEP; it sure is. If the site badly needs to be rebuilt, then find a damn programmer/designer who can do it for you! Don't just take the damn money knowing ahead of time the site is doomed to failure. Sheesh. Prob? The problem is obvious from many in this thread and elsewhere, and from this very good detailed article about the problem. The problem is very obvious industry wide. I don't know how much authority you exert over your clients Doug, but generally consultants are only able to offer their clients advice, not force them to adhere to it. Putting aside the insinuation that every SEO apart from yourself is money-grabbing and immoral, of course you need to exercise judgement when deciding whether or not to take a new client on. If a firm took the money in the situation outlined, not only would the client be left out of pocket, the reputation of the SEO would also take a hit. However, it's hardly ever that 'cut and dry' as I'm sure you would appreciate. After all, future conversion rates can't be accurately measured by the visual appearance of a website. Client ROI is the paramount concern and it's the duty of an SEO to give their clients advice which they believe will garner them maximum return on investment. However, this isn't to say that the SEO company has suddenly assumed full responsibility for every aspect of a company's online business. A clever idea to parse your own log file, as Google referral URLs contain the SERP your link was on. Just noticed your post Gavin. Yes; I agree with most of that. If you are in fact just talking about some kind of consultation, then I agree with you as you cannot break a client's arm to get something done they don't want to do. On the other hand; I hope these consultants are telling the client upfront and before they take the money, that it's mandatory they implement the advice you give them. If they can't agree to that, walk away. I guess I come at things from a SEO and designer point of view. There is rarely a client who doesn't need more than a simple phone consultation. I like the hands-on approach much better as that way you are not tied to what the client says you can do or cannot do. We make all changes ourselves and don't take any no's from a client. I drop them like a hot potato if they don't take my advice... all of it. After all; the site came to you for help, and not the other way around. I've never tried to tell my Doc what they could do or not do, nor my plumber or electrician. They are the experts, not me. The SEO industry should not be any different than that. Too many in this industry seem to pansy out to a client when they should actually be more tough. Because of all the bogus information out there, it's important to be tough with owners coming to you for help........ and not lay down like a puppy or wimp. Sound advice on client management, Doug. A full service approach is certainly desirable - not least because, just like with doctors and electricians, there are a surprising amount of people who seem able to convince themselves they know better than the expert they are paying to perform a service for them. Taking the decision out of their hands means you don't have to fight them every step of the way. However, this model isn't appropriate or desirable for every business. Consultancy advice generally needs to be there to take, leave or adapt as required. Just like a doctor might tell someone it's advisable to have the surgery etc. There could be a very good chance they'll die without it, but once the expert recommendation has been made, the final decision is theirs. Unless you assume control, all you can really do is give someone the full picture and the likely outcomes of any action or inaction. Google is indexing my site already, and I get traffic from the organic ( almost 50 daily) and my ranking is still 0. I want to know if I'm doing anything wrong that my ranking doesn't go up. Because I have other sites that get less traffic and they rank 2 or 3. My site is: <a href="http://hardmoneyloans.org" rel="nofollow">http://hardmoneyloans.org</a> Please help me. Thank you. I fully agree with this. SEO must not aim for high traffic, but for the right traffic. I think I read this on another blog. I just don't remember who's. Thank you for this greatful information. Really good content for my site. Giving a specific service approach is ideal indeed. Just like with other specializations like mechanics and therapists, you should be able to convince your customers that they are paying for the best service possible. This is an excellent article, indeed! I found it very useful and informative. However, I think that the first point is the most important point. Fooling around with Google may not be a great idea and using the automated tools etc to fraud the system can be fatal for your online presence. It is a great idea to stay consistent, do business with integrity and do the hard work. That is the best shortcut to success.